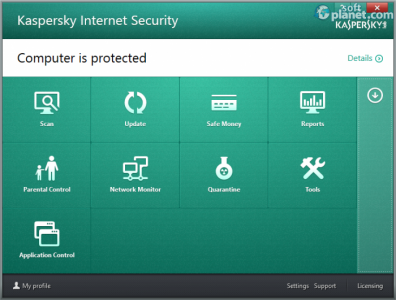 SoftPlanet makes it possible for everyone to get free Kaspersky Internet Security download directly from our servers. There is no registration needed for downloading. 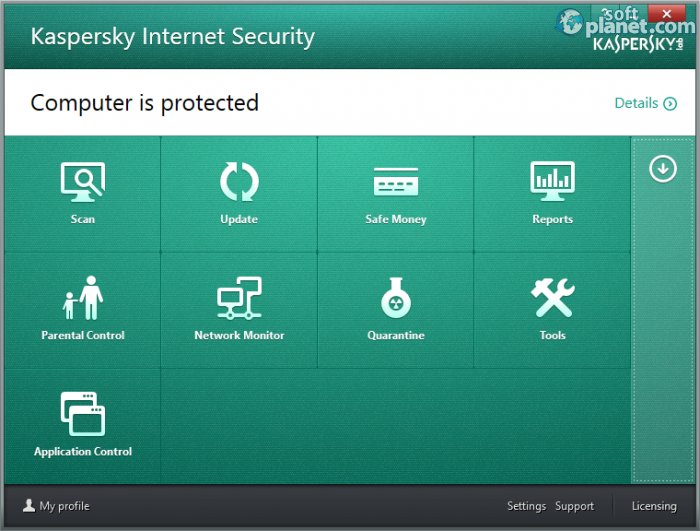 Kaspersky Internet Security 2014 is an ultimate security suite for protecting your system. It offers multilevel protection like antispam, antispyware, privacy protection and parental control modules. 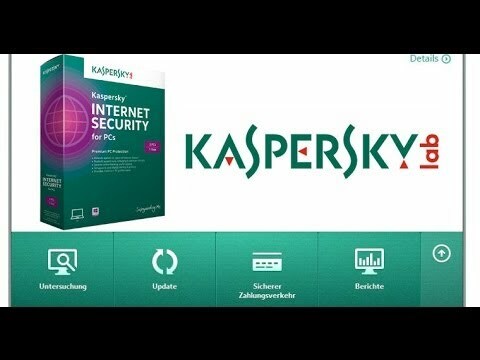 The 2014 edition of Kaspersky Internet Security includes everything you'd expect from a security suite, and all of the components work as they are supposed to. Kaspersky Internet Security 2014 is one of the best security software suites available on the market today. The main reason for that is its rich list of features, delivered to the user. It provides you with the ultimate package of security tools. Kaspersky secures your files and e-mails, blocks malware and protects you in your virtual environment simultaneously. There are not many software applications, which can boast the same thing. You are able to restrict access to some system areas, using the Parental Controls. The Network Monitor, Vulnerability Scan and Reports are other great features you will get in Kaspersky Internet Security 2014. I adore its interface. It has a very classy and clean design and gives you a sense of security. It is really easy to find a particular tool. Unlike its rivals, the interface of Kaspersky is not just simple, but it works very quickly. Navigation between the menus is instantaneous. During the whole test, I couldn't find something wrong with the interface, except one small thing. 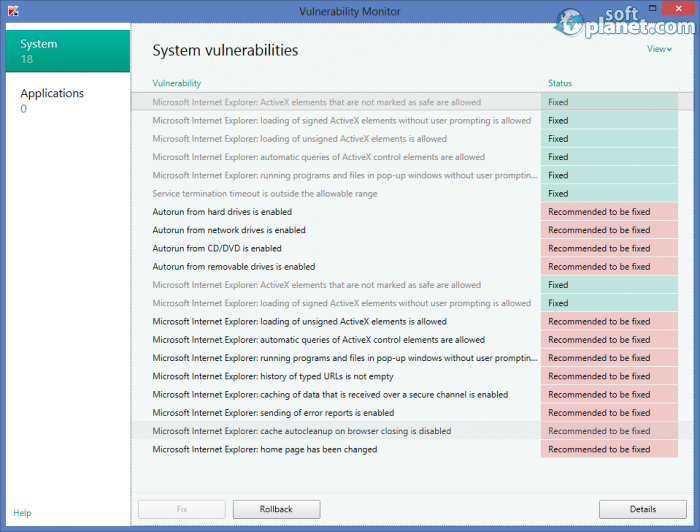 When you perform a Vulnerability Scan, you are able to fix only one by one. This is a bit annoying, especially if you have more than 20 weak system spots. It will be great if there is a Select All/Unselect All button, allowing you to mark all of them with a single mouse-click. The team of Kaspersky Lab bets on a simple and functional interface, and in my opinion they have really managed to achieve it. 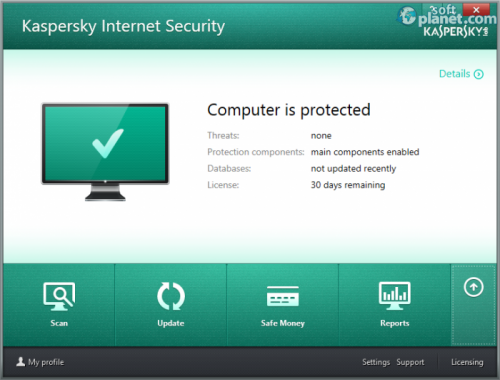 As you may have noticed until now, Kaspersky Internet Security 2014 14.0.0.4651 is full of different features assuring you the ultimate protection for your system. Many of you might think that it will slow down your OS dramatically during scans and other processes. And you will be quite right. It consumes about 90% of the CPU resources and around 400 MB of RAM. I would like to recommend to limit the running processes once you have started the scan. However the guys from Kaspersky Lab have really tried their best to assure the best protection for you. For example, when you start a scan, the program asks you whether you want to check for updates in order to provide you with latest antivirus definitions. The security reports are superb as well. You can get info by day, week, month and whole period. Another option, which is available to you, allows you to filter by the type of threat as well. In conclusion, Kaspersky Internet Security 2014 is an ultimate protection software suite, which can assure you safe browsing and PC workflow. It provides you with a long list of features, which you can test for free just for 30 days. In order to continue using it when this period expires, you need to purchase it for just USD 59,95. 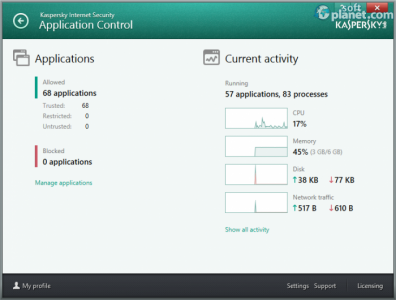 Kaspersky Internet Security is VIRUS-FREE! Our security scan shows that Kaspersky Internet Security is clean from viruses. The current version of Kaspersky Internet Security has been scanned by our system, which contains 46 different anti-virus algorithms. 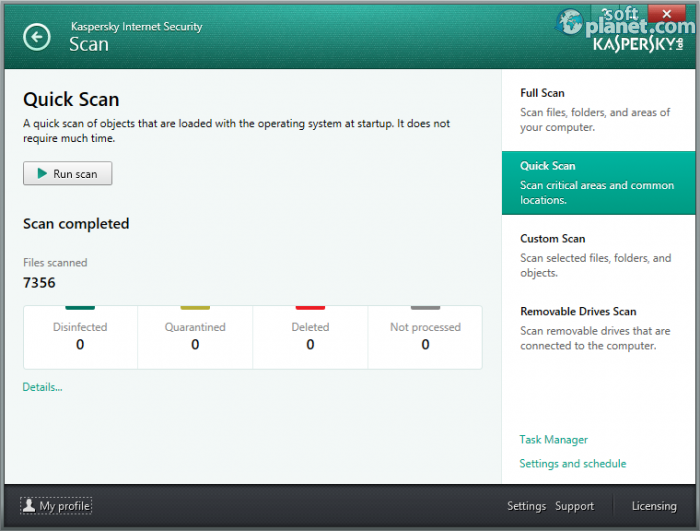 That ensures that Kaspersky Internet Security 2014 14.0.0.4651 is 100% safe for your computer.